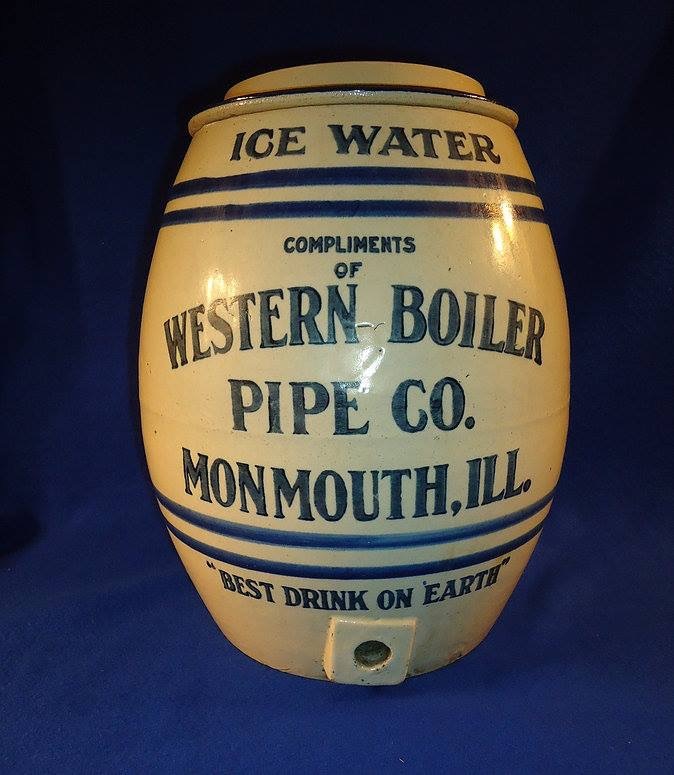 WESTERN BOILER PIPE COMPANY OUTSTANDING POTTERY ICE COOLER! 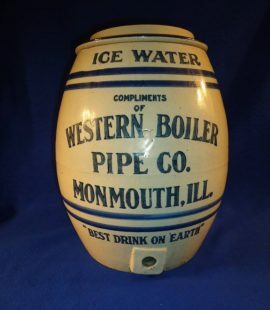 The Western Boiler Pipe Company out of Monmouth, Illinois is well known for producing millions of stoneware or pottery whiskey jugs, crocks, pots, and all different styles of earthenware products. The company was based in the center of Illinois, where about a dozen larger companies produced some great advertising items at that time. The Ice Water Cooler pictured here is very unusual, as it is certainly an item produced to advertise their companies products. The blue band design was very commonly used by the Western Stoneware Company. The Western Stoneware companies products can often be easily determined by their unique tree leaf design on the front face of a lot of their stoneware jugs and crocks. However, the earliest products they produced often did not use the leaf design, similar to this water crock. Ice coolers were not in demand like their jug and crock counterparts, so I can only assume this stoneware cooler was designed to advertise a specific component of their business ability. In 1906, five Illinois potteries, one Missouri pottery and one Iowa pottery were purchased and became known as The Western Stoneware Company. Western Stoneware at that time had 7 plants which were as follows: Macomb Pottery Co. & Macomb Stoneware, Monmouth Pottery Company ,Weir Pottery, White Hall, IL Pottery , Clinton Stoneware Co. of Clinton, MO, and The Fort Dodge Stoneware Company out of Fort Dodge, IA. Though some of the buildings of plants were eventually sold or destroyed by fire, as of today some of these properties remain owned by Western Stoneware. One of the plants is now a dog food products company and remains a monument for what was once one of the largest potters in the U.S.
WHY DID SO MANY PRE-PRO ERA BREWERIES USE EAGLE LOGOS?THE WHISTLE GOLDEN ORANGE DRINK ELVES SOLD A LOT OF SODA!